The death metal scene in France is more vibrant and alive than ever before. Along with the Dune inspired Nephren-Ka (surprisingly not a lazy Nile knockoff) Abyssal Ascendant is inspired by the literature of fantasy/pulp authors Clark Ashton Smith, Robert Howard and H.P. Lovecraft. Fronted by the couple Florent (guitar) and Fanny (bass guitar) and thrust by the percussive power of Spanish drummer Raúl Fernández Abyssal Ascendant combines the best traits of Tom Wilkinson era Immolation with the dual vocals, technicality and high-speed precision of "King Of All Kings" Hate Eternal. The addition of synthesizers enhances the cold, otherworldly atmosphere that is somewhat similar to post-"Forever Advancing… Legions" Mithras. The 'Celaphais Chant' intro with its deceptively serene Arabic chants immediately puts the listener on the wrong foot making the band's assault all the more effective. The atmospheric breaks or conclusions to several songs greatly add to the feel of alienation. The few solos are worth the wait, and hopefully we'll hear more of those in the future. Abyssal Ascendant understands what made the ABC records from Morbid Angel so effective, and reconfigures that into a pulsating modern and more technical interpretation of the genre. The drum production is a bit plastic and flat from time to time, but otherwise it is functional. 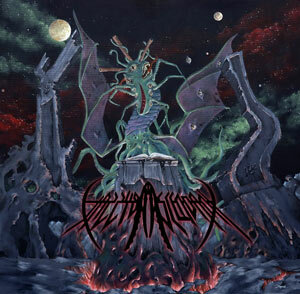 "Chronicles From the Doomed Worlds" is what a contemporary death metal record should be.